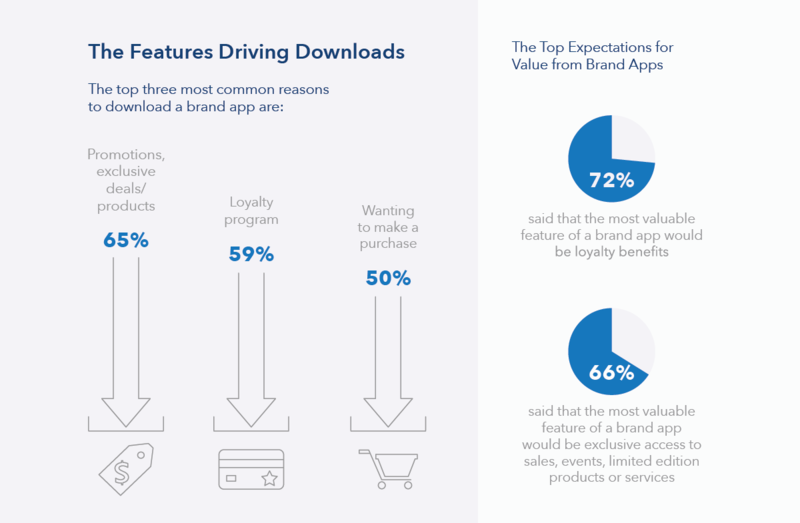 New research from WillowTree reveals value drivers in brand apps that result in more transactions and deeper brand loyalty. Download this full report as a PDF here. There’s an app for that. It’s the slogan Apple introduced nearly a decade ago, and it was a catchy way of saying that anything we wanted to do, we could do on our smartphones. When that slogan was first coined, there were only ~100,000 apps in the Apple App Store. Now, as we near the 10th birthday of the mobile app ecosystem, there are over 5 million apps across all major app stores. This growth points to an extremely saturated market for consumers. While this may threaten to diminish the role of brand apps, the reality is that the brand app is becoming the cornerstone of the relationship with the consumer. The saturation of the app market forces brands to think about their brand app as a core product and not just a check-box item. By building value and purpose into the brand app companies can drive longer-term engagement with customers and positively impact brand loyalty. Even with 5 million apps in app stores, consumers are demanding incredible brand experiences via brand apps. Consumers have come to rely on apps for a continually growing number of tasks, from buying groceries to talking with a licensed therapist. As a result, their relationships with apps have become deeply personal, and they’ve become accustomed to advanced functionality, ease of use, and app experiences that are fully customizable and finely-tuned to their needs and preferences. Evolving consumer expectations have big implications for the brand app—a mobile app designed to extend the brand experience beyond a company’s core product or service offering. Consumers want the same features and capabilities that they enjoy in the other apps they use. Given the disposable nature of consumer behavior today, what once was more of an obligatory presence among countless mobile apps is now a critical opportunity to meet high consumer expectations, drive engagement, and most importantly, foster brand loyalty and brand advocacy. For consumers, the ability to create and grow loyalty within the app is what sets the app apart from other mobile experiences. To uncover that insight and to better understand consumers’ brand app usage and expectations, WillowTree surveyed over 1,000 adult consumers. Negative brand app experiences lead consumers to delete the app, not recommend the brand to others, make fewer purchases, and diminish brand loyalty. Many consumers are downloading and using brand apps, and the most popular brand apps are from banks, restaurants, and retailers, with consumers citing bank apps as those they use most frequently. Positive brand app experiences lead consumers to use the app regularly, sign up for loyalty programs, make more purchases, and become more loyal to the brand. Brand apps are seeing significant momentum, as most consumers reported that they are downloading and using these types of apps with regularity. The most popular categories are banks, restaurants, and retailers, which all rely heavily on driving frequency and loyalty, with consumers citing bank apps as those they use most frequently. Consumers downloading brand apps are initially looking for transactional features, uses and benefits. However, the primary values of using brand apps include loyalty programs, purchasing power, deals and discounts. While consumers are most often looking for transactional features and uses in a brand app, they would also like to see value that matches their experience with other prevalent consumer apps and with the brand itself. 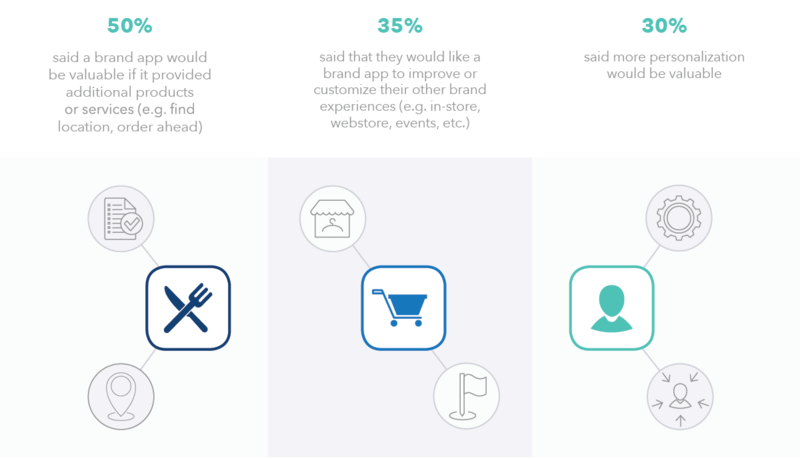 They want to find features like value-add services or products, ability to customize or personalize their experience, and to have omni-channel access to their favorite brands. One of the biggest connections between the brand app and the consumer is the impact on loyalty. The majority of respondents who say they’re loyal to certain brands also said they’ve downloaded the app for that brand. Most consumers are finding they’re met with a positive experience, which holds tremendous potential for growing brand loyalty, driving engagement, and increasing purchases. 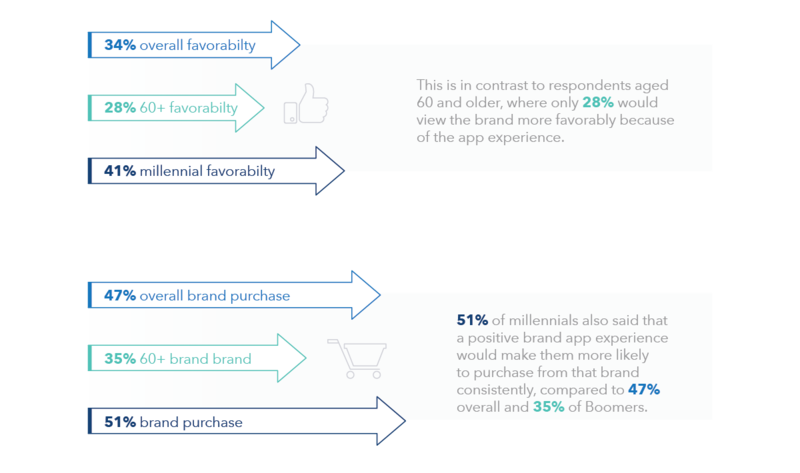 The connection between a positive brand app experience and brand loyalty is even more pronounced with millennial consumers. While overall, 34% would think more favorably of the brand because of a positive experience with the brand app, 41% of respondents aged 18-29 said they would have a more favorable view of the brand. Just as it’s important for brands to know the wide-ranging effects of positive app experiences, the potential impact of a negative experience should be a concern as well. Consumers who say they’ve had negative experiences revealed a number of damaging implications for brands. These negative experiences are not a result of unmet expectations for value, but are driven by more basic considerations like user experience and technical reliability. We explored this consumer behavior in order to provide brands with the value and elements needed to create a successful brand app. But in addition to those points, what we uncovered was the significant impact of the brand app experience itself. Almost three quarters of consumers download the apps of brands to which they’re loyal, and an encouraging 85 percent have had mostly positive experiences with those apps. In turn, these brands that are fostering positive experiences with their apps are gaining not only loyal customers, but brand advocates who are happy to sign up for loyalty programs, make more purchases, and spread the word by recommending products and/or services to their friends. Conversely, a negative experience with a brand app has a far greater impact on consumer opinion than we had initially hypothesized. The fact that 68 percent of consumers would delete the app is not a big surprise. Why keep something that has no value? But nearly one-third of consumers would also make fewer purchases from that brand. And the same amount would be less likely to recommend that brand to others. As app stores become further saturated with options, it’s been easy for some to assume that this lessens the value of brand apps. But the brand app is becoming central to the relationships that brands foster with their consumers, and this research cements the need for brands to view their app as a true product—one with enormous potential to create brand loyalty and turn consumers into brand advocates. This puts even more pressure on the brand app to continue evolving to address both value to users and unlock additional business value and brand loyalty.